Contemporary design, modern look, fresh and new! Height - 180 cm -70.9"
Width - 280 cm - 110,2"
Depth - 40 cm - 15,7"
1 x Closed wall hanging cabinet 90/35/30 cm - 35,4"/13,8"/11,8" -- front in gloss, front opening system "PUSH-CLICK"
Wall units made of high quality materials. Furniture that fits perfectly well into every living room. 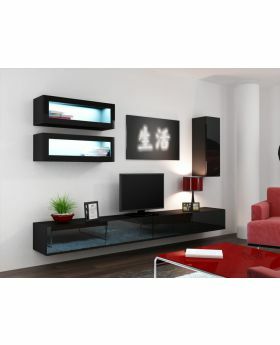 In the category of wall units we have a large offer of furniture for living rooms such as tv wall units, wall shelving units, etc. We always strive to offer only the best furniture for the best price!